To find out about lymphedema, it helps to know some basics about the lymphatic system. 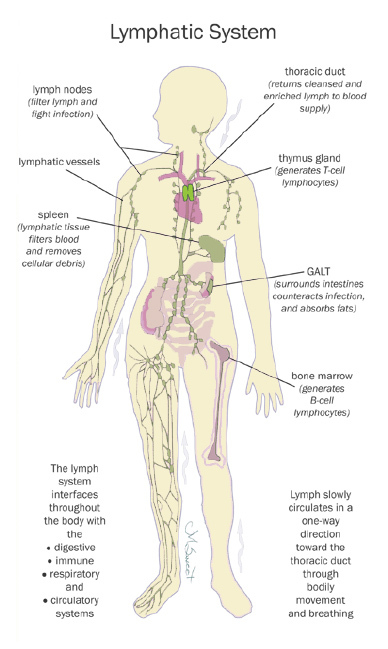 The lymphatic system is where much of the body's defense against disease and infection is located. Lymph fluid contains white blood cells that help to fight infection. Lymph nodes work to block infection by filtering out toxins and germs. When the lymphatic system functions well, it helps to keep your body healthy. When the lymphatic system is faulty or has been damaged, fluid may collect in the tissues and this build up can cause swelling or other effects that could be the early signs of lymphedema. Some people are born with a faulty lymphatic system; it may be inherited or can occur as the fetus develops. When lymphedema is caused by a defect of the lymphatic system, it is called primary lymphedema. It may be present at birth, develop when puberty begins or in adulthood. Primary lymphedema is a lifelong condition with no known cure at this time. Ongoing management and care is the key to the best quality of life with primary lymphedema. Other people develop lymphedema due to an event that damages or blocks part of their lymphatic system. In this case, it is called secondary lymphedema. The most common cause of secondary lymphedema is the result of treatment for some cancers (breast, cervical, prostate and melanoma). Cancer surgery may remove or damage lymph vessels and nodes. Radiation therapy for cancer may also cause lymph vessel and node damage. Other causes of damage to the lymphatic system include trauma caused by an accident, injury or a burn.